A dog named Bear who was found on the brink of death is said to be making great strides toward recovery. The Labrador-mix was first discovered by Mark Gillespie, who was reportedly walking his own dog near an old bridge on the morning of April 20. According to the News Gazette, Gillespie recognized Bear as his neighbor's dog, so he called out to him, "and he just kind of looked around but couldn't see because his eyes were shut. It was obvious that he was whipped, that somebody had beat the crap out of him." Upon closer examination of the scene, Gillespie became sick to his stomach. The poor pup's leash was tethered to the bridge so tightly that his feet could barely touch the ground. Further, he'd been shot through the jaw and his mouth was taped shut. Naturally, Gillespie called 911 for help -- and when they arrived, they were just as in shock as he was. 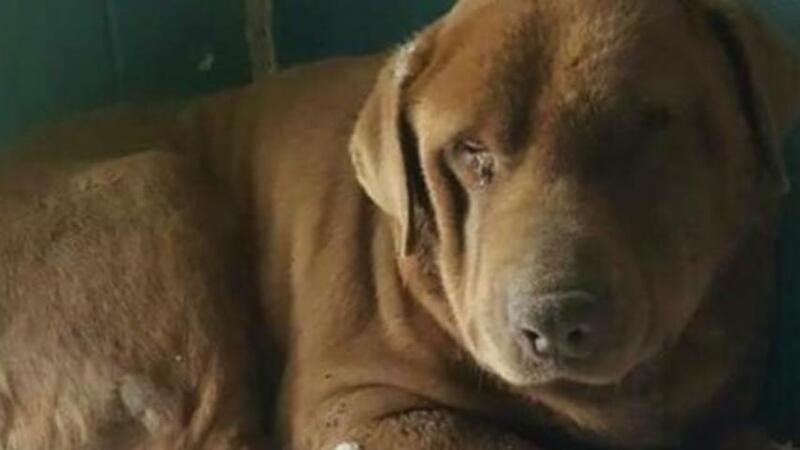 One of the responders, Darrell Foster, said that in his 15 years as Ford County's animal control officer, he had never seen a case of animal cruelty as shocking as this one. Bear was immediately rushed to a local facility for urgent care, and once donations to a GoFundMe campaign started rolling in, he was transferred to the veterinary clinic at University of Illinois to see a specialist. While the pup is certainly faring much better than when he was first found, he still faces a long road to recovery. We talked to the specialists today and they decided that Bear's jaw is broken in so many places that a surgery will not be able to fix it, but the good news is that if we give him time it may heal on its own. His jaw will never be back to how it was before and he might never be able to eat hard dog food again but he should be able to heal and enjoy wet dog food. Bear will need a feeding tube in the mean time to allow his mouth to heal and he will also be having work done to a hole in his leg most likely due to a previous injury. His thyroid levels were so low this afternoon he was not able to have surgery but he has started medication to get those levels back to normal so they can get the procedure done as soon as they can. Bear does liven up a little when he gets to go outside so he is showing small improvements everyday. Again thank you to everyone for all of your support Bear and I really appreciate it. A small silver lining for poor Bear? Many in the community have offered to adopt the canine as soon as he's ready to leave the hospital. Let's hope he makes a speedy recovery and can be on his way to a new, loving home as soon as possible.